Every two hours on average, a freight train pulls out of Mormugao Port, 6 km from Vasco. Each of its 58 wagons is covered with blue tarpaulin, the edges of which flap in the breeze, revealing what lies underneath — about 65,000 kg of coal, the toxic black dust hanging in the air like a shroud over each wagon. This train sets off on an 18-hour, 352-km journey eastward to Karnataka’s Toranagallu in Bellary district, home of JSW Group’s steel and captive power plant. The Indian Express tracked over a dozen such trains up to the Goa border — except for a 5-km stretch where access was denied during the monsoon because of the presence of a waterfall. And found that each train gouges out a thick black line (see map below) starting from the port at the western tip, dipping south around Velsao, snaking up from Sanvordem, crossing the Zuari river network, villages around Chandor, paddy fields, indigenous habitats in Majorda, cashew and coconut orchards, and fragile forests before reaching Kulem just short of the Western Ghats. This rail transport of coal totals 11 million tonnes, of which 10.11 million tonnes belong to Jindal group and the remaining to Adani. 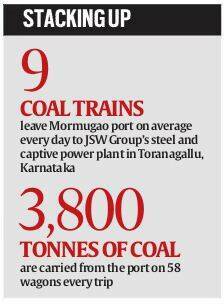 By 2030, as The Indian Express reported Wednesday, Mormugao Port Trust wants to unload 51 million tonnes, most of which will be carried to the Deccan hinterland using rail. For this to happen, the Goa chapter of the 2016 Sagarmala report on coastal upgradation says, “local government has to be pressurised from the Centre for the completion of doubling the line”. With the Railways having acquired 60 per cent of land required for doubling the tracks, the Hubli Division of South Western Railway has made good headway in Karnataka. 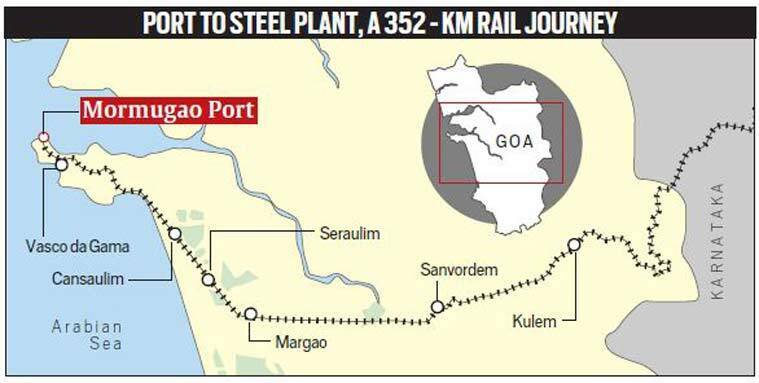 In Goa, the acquisition is at different stages for the requirement of 10 hectares — spread like a strip alongside the existing track — along 64 km between Vasco and Kulem. “We have started laying tracks at regions where we have acquired the land. We are looking at three years for the entire process and execution,” says E Vijaya, Deputy General Manager, South Western Railway. At her Hubli Headquarters, with a large rail map spread out on her table, Vijaya says, “For us, Goa is Vasco”. His words don’t sound reassuring in the trundle of the train as it pulls out of Vasco, Ground Zero of Goa’s rail coal trail. From a distance, the yellow safety hats stand out against the black coal hills. A half-loaded German vessel — 1,80,000 dead weight tonnage — is anchored at Berth 6 operated by JSW. With first anchor at Jaigarh, JSW’s private port in Maharashtra, the vessel is shedding the remaining coal for the steel major’s Karnataka plant, according to port traffic records. Everything is in motion, the wharf cranes, the pulleys and the men involved in loading coal in two cycles from the ship to tall silos and on to the rail wagons. The port is a medley of roller coasters — blue, green conveyer belts. For the Redkars, the oldest family at the harbour, this is a typical morning view. The women, from oldest, Saraswati, 75, to child Vrishti, 2, have their eyes on the conveyor belts. This joint family has 35 members, all battling what they call the “unstoppable menace” — coal, whatever the season. “This summer, the coal breeze was stronger and hot. Don’t forget, coal dust bites, too,” says Saraswati’s son Vignesh, 36, a port employee. According to an Environmental Impact Assessment (EIA) conducted in September 2016 by the port for the expansion of JSW’s berths 5 and 6, the company has targeted 70 per cent efficiency for cargo transfer to wagons. This would lead to the time taken for a full round of loading being cut from three hours to one-and-a-half hours, and to move coal imports and return with steel exports from 11 hours to six hours. It’s 9 am and at Gate 9, a cargo train is ready to leave. Similar tracks branch out of Berth 7 (Adani). For now, a whistle blows and the train starts moving. In Vasco, the chorus from local doctors is: an unmistakable rise in cases of respiratory diseases under their watch. At the clinic of Dr Pedro Bravo da Costa, 73, patients walk in for emergency nebuliser shots. Costa says before the coal transport began, he saw only 40 patients “the whole day”. Now he’s lost count as cases of bronchitis, sinusitis and pulmonary disorders have increased manifold, he says. His own clinic needs dusting thrice a day. “Earlier, the cases didn’t need ICU recommendations. Now I have had a few. Further, all respiratory problems show the same symptoms. They are all patients of coal dust, they just keep coming by the hour,” says Costa. In 2012, the Panaji bench of the Bombay High Court, after 11 years of proceedings, shut down two coal berths and forced the state government to introduce air ambient quality monitoring stations. At the time, records show, the port handled around 5.64 million tonnes of coal. In 2016-17, they show, coal imports of JSW alone stood at 10.11 million tonnes, against an awarded consent of 5.50 million tonnes, a mark that was breached way back in 2012. And the coal mountain keeps climbing. During an eight-day public hearing — one of three facilitated by the port in April and May on deepening of the navigational channel, expansion of JSW’s berths 5A and 6A, and redevelopment of berths 8 and 9 to be operated by Vedanta — speakers questioned the “medieval methods” used to pack wagons. One of them, Savio Correia, 48, an environmentalist from Vasco and whose house is next to tracks, calls them “tarpaulin-covered graves”. Savio’s wife Sandra, 46, is worried. Her elder son Sherwin had a breathing problem and antibiotics have stopped having any effect on her ailing younger son Stanislaus, 6. “We travel with their nebuliser. Several doctors say it’s due to coal. But when I ask them to give that in writing, they don’t. They are scared,” says Sandra, a former consumer court judge. Such haphazard expansion will lead to a disaster management SOS call one day, warns Advocate T T Shreedharan, who fought the earlier case in the High Court. “There are petroleum and ammonium tanks right next to the expanding coal berths.” he says, as he prepares his next petition “this time adding a facet of disaster management along with high pollution levels”. The wagons grind to a halt at Cansaulim. Across the tracks, is the home of Zulema Barros Pereira, 85, with oyster shell window-panes and traditional balcaos, now crumbling “due to vibrations from the track”. “With more rakes, what will happen to this century-old house? The windows already rattle and the house has developed cracks. Redevelopment can never replace such heritage homes,” says Zulema. Outside Zulema’s house, schools have closed for the day and children are on their way home through arterial roads back to their villages. But there’s one hurdle on the way – a coal wagon parked on the tracks. With no foot overbridge in the area, Anjali, 13, and her younger sister Kirti, 11, duck under the wagons to cross over. Kirti’s pinafore is stained with grease from the wagon. “These coal wagons are always there, on our way to school and back… Sometimes, our heads hit the bottom of the wagon. Our father hurt his shoulder once while crossing under a wagon. But now, I have worked out a few ways to crawl through. I tell Kirti to cross through the gap between bogies, it gives more space to protect the head,” says Anjali. Luis Da Costa, 66, a retired professional says the sand mounds here will be the first to be filled with debris from tracks. “These are our village assets where we do rainwater harvesting and it’s being destroyed. Coal cannot be more valuable than that,” he says. Another villager Anthony D’Silva, 40, points to a “bigger emergency”. The St Lawrence Chapel built in 1599 is next to the tracks and may have to go but not too many know of this yet, he says. “Once the Church announces the chapel might be demolished, news will come like…boom,” he warns. D’Silva says he lost acres of paddy field to the Konkan Railways earlier. “Compensation was Rs 6 per sq m. Now I drive a taxi. That’s the irony. My field was taken by a rail network to bring more tourists. What will these coal tracks give us now?” he says. Ahead at Utorda, the coal wagons have to cross 25-year-old Dolvyn Braganza’s ancestral paddy field. A new stretch of her field will be eaten by the tracks, she says, but the coal has already crept in. “The government should encourage cultivation and stop Goans from migrating, instead of importing coal. The demographics in Goa are such that there are not many native Goans any longer. The numbers are mostly floating population. And now, the Railways has come to take our farms, and the homes of the Goans who chose to stay. Where are we supposed to go?” she says. At Seraulim, the church is on the other side of the railway crossing. Traffic has stopped for a passenger train, a cargo train will follow. The wagons divide a village, holding everything to ransom. Residents say that during Sunday mass, even a single train crossing can delay their church visit. That is five minutes of mass missed, they say, and with 30 trains a day, that is an entire mass gone. “The Church even stops the ceremony every few minutes as the trains pass. Nobody looks into these facts on the ground. These things are important to us,” says Elvis Coutinho, 51. Seraulim, which opposed the Konkan Railways project in 1992-1993, is also where the biggest resistance against the doubling of tracks for coal is taking shape. In 1993, the government issued a shoot-at-sight order against protesters. The Railways won. The locals speak of “death of village life” and “cattle deaths along the tracks”, too. “We have been asking for a cattle underpass for a decade. But with no bridge for us, I wonder if they will ever make any arrangements for them,” says Coutinho. Horticulturist Rodney Almeida, 67, whose house is 70 metres from the coal tracks, says when he contracted asthma two years ago, it took him a while to find out the reason: “black powder”. “As a horticulturist, I am always surrounded with greenery and I was keen to know what was causing these sudden bouts of coughing, and breathing problems. I realised that they coincided with the presence of a black powder in the house. I visited my doctor and he asked me if there was a source for this powder. My wife and I found it was coal from the trains. We watch them cross us every day and we are convinced our air is in danger,” says Almeida. At the other end of the track is the house of retired banker Vincente Fernandes, 62, a veteran of the Konkan Railway agitation. “We will have to agitate again. We are not talking of one more train. The doubling of tracks means, 20-30 trains more. There is no access to our homes, no bridges to walk to the other side, no roads made friendly for us,” he says. With the South Western Railways team trying to survey his compound, Vincente is always on guard. Many stations after Chandor, the journey is a straight stretch to the Western Ghats. At Kulem, a coal train has paused at the station, waiting to be powered by three engines through the 37-km Ghats passage to Tinai Ghat. The wagons will have their hardest journey yet, as they go through the Braganza Ghats, Goa’s most ecologically fragile stretch, and home to Dudhsagar falls and Bhagwan Mahaveer Wildlife Sanctuary. With Caranzol, Dudhsagar and Sonalium stations on the way, the wagons take at least three hours to cross this stretch, with three brake tests at each station. As the tracks cross downward into Londa Junction, the base of the Ghats on the Karnataka side, the first signs of fresh double-tracking activity emerge. About 285 km away, is Toranagallu. JSW does not undertake road transportation for its cargo. All cargo moves by covered rakes only. As a measure to control pollution, we innovated a unique feature to cover these rakes as the cargo is loaded from the silo. JSW maintains high standards of environmental compliance. We were the first company in India to implement fully-covered operations with a giant shed of 105m x 450 m x 52 m at our port in Jaigarh. We are in the process of establishing a 125 m x 275 m covered shed at our berths in Mormugao Port, Goa, as an additional pollution control measure. The shed is currently awaiting necessary regulatory approvals. About 80 per cent of cargo is transported through mechanised wagon loading systems and the rakes are covered prior to departure from port thereby ensuring full-fledged check on pollution while the rake is enroute to its destination. About 20 per cent of the cargo is dispatched by road through mechanised truck loading system, each truck is covered and thoroughly washed after loading, and even the undercarriage is washed to ensure a clean dispatch by road. Furthermore, regular patrols are carried out by the port team to check for any spillage on road during transportation and react in real time thereby ensuring negligible spillage incidents. We take utmost care to preserve the environment and comply with all the applicable rules and regulations. Our cargo yards have all round retaining walls and cargo is stored in covered condition, with regular automatic yard sprinkler system to ensure dust suppression, firefighting system for emergency usage, dry fog system at all cargo transfer points for dust free cargo transfer, automatic truck and wheel washing system, a portable mist canon system, water tanker with road sprinkler, tractor mounted road sweeping machine, windscreens and green belt around the yards and jetty gate. These systems are benchmark technologies that we have in the entire Adani Ports and Special Economic Zone Ltd portfolio. Vedanta is not using the Mormugao Port berth for any coal handling. We are importing 0.75 Mt per annum for our in-house consumption and not for sale. We are not handling coal at MPT land, so no question of creating any dust pollution. It is directly unloaded from mother ship to barges mid sea and the same are being unloaded at the plant. Moreover, the moisture in coal is 10%, which doesn’t allow any dust generation. As a responsible organisation, we abide by all norms and regulatory compliance.